ON THE COVER of his Nutshell Library in 1962, Maurice Sendak posed a memorable visual analogy between a little boy engaged in eating a bowl of chicken soup and an alligator gleefully reading a book. Both activities nourish children, albeit in different ways. Authors of notable children’s books regard their projects with gravity as well as levity, and their youthful audiences with respect. They recall the hot passions and curious puzzlements of childhood. They aim high. In defiance of this wisdom, however, American publishers seem bent on producing a spate of trivial children’s books by celebrities. The nutritive content of most of these books is equivalent to lollipops, and yet they have met with appalling commercial success. A recent entry into the fray is an American history book in rhyme for the four-to-eight-year old set by Callista Gingrich, the third Mrs. Gingrich. Her thirteen double-spread paged effort featuring a cartoon elephant named Ellis has actually reached #3 on Amazon. Borrowing its title from the patriotic anthem “America,” the book serves up a propaganda dish of rather benign right-wing political ingredients. Gingrich’s pages trade in egregious simplification, the elimination of all conflict, suffering, and debate, a mindless joviality, the complete absence of diversity, and an elephant-child character that, apart from symbolizing the author’s political party, displays no discernable personality and undergoes no development of any kind. It is inconceivable that this book would have been published without its author’s high-level connections. An eight-year-old boy of my acquaintance disdainfully suggested that it was better suited for three-year-olds. A roly-poly toy elephant sits in the reading room of the Library of Congress “reliving” a brief romp through Gingrich’s version of American history. Apparently for picaresque charm, a foolish-looking bald eagle, stripped of all the strength and power that in 1782 made this bird the choice for our national symbol, appears cheerily on every page. Throughout the book, continuously and idiotically, no matter what is going on, the human and animal characters, without exception, smile. Washington and his men, battling ice floes while crossing the Delaware in a hackneyed version of Emanuel Leutze’s iconic image of 1851, smile. Marines, captured in bronze on the familiar Iwo Jima Memorial, plant the American flag on that Pacific island and smile. Boston colonists, innocent of controversies swirling amongst them over their seditious act, toss tea leaves and smile. Victims of a disaster, assisted by volunteers (volunteerism will solve our social ills) picnic under cozy blue blankets while consuming quantities of donated picnic sandwiches, apples, and chocolate chip cookies and smile. American flags proudly wave on more than half the book’s pages, often repeatedly within the same illustration. You will look in vain for the depiction of a single African American or anyone of Asian descent. Four innocuous female Native Americans smile at Thanksgiving, in Sweet Land of Liberty’s sole nod to the diversity of America’s population. And what about Abraham Lincoln? Rather than struggle to tell children anything about how our nation was torn apart in a great Civil War and explain to them the painful tribulations of Lincoln’s presidency, these pages portray our sixteenth president as a contented boy in patched overalls under a tree. The Ellis Island page even has a Statue of Liberty smiling, and children, while learning that people came “from distant shores, / arriving in a country they had never seen before/ Speaking different languages,” must stare at a New York harbor dotted with pleasure boats—speed and motor crafts—each bearing the Stars and Stripes: an absurd illustration for the subject of immigration. Are five-year-olds too young to hear a few lines by Emma Lazarus? When children’s books evade uncomfortable truths and whitewash the history of what is real, they betray their audience. In addition to manipulating children and preying upon them, we adults, by writing, publishing, and purchasing such books, unpardonably underestimate, disrespect, and mistrust children. Callista Gingrich, after blithely addressing herself “to American Patriots, young and old, who make America a special nation,” not only fails to teach American history: she withholds it. The good news is that most children, after flipping through these pages once, will be sufficiently bored that no lasting impression is likely to be made. 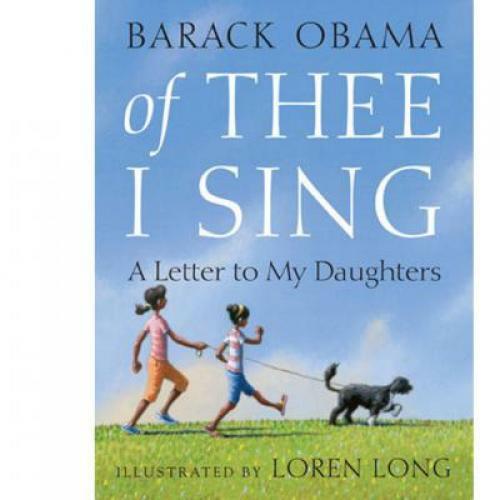 Sweet Land of Liberty may have been intended, at least in part, as a riposte to the publication last year by President Obama of his own attempt at a patriotic book for children. Of Thee I Sing borrows from the same anthem but takes a different phrase for its title. Surely we can admire a president who cares enough about children and their education to make such an effort. (Theodore Roosevelt wrote a rather militaristic book for children, with Henry Cabot Lodge, in 1895, and called it Hero Tales from American History.) Obama’s book, addressed ostensibly to his daughters, who are named only on the jacket flap, serves up a concoction nearly as lacking in substance as Gingrich’s. Self-consciously politically correct, it consists of a medley of “snapshots” with no plot and no pretense of telling American history. Frankly and peculiarly ahistorical (Billie Holliday comes before George Washington), the book seeks to introduce children by a deft sentence or two to thirteen (yet again) American figures of note. Among its pantheon, you will find five women, five people of color, two artists, a scientist, a baseball player, three social reformers, and two American presidents. But the child reader learns almost nothing about any of them. Owing to the extreme brevity of presentation, Obama’s book proves as lightweight as its Republican counterpart. Its illustrations resemble claymation figures and thus with few exceptions (the portrait of Martin Luther King, Jr. is one) produce an uncanny frisson of contrivance and weirdness, while at the same time the text tries to foreground the child reader by favoring direct address over rhyme. Yet this produces false notes of its own, because it comes across as neither genuinely personal nor as unashamedly impersonal. It rings inauthentic even as it tries hard to be genuine. Obama’s “you” is everyone and therefore no one. And then there is Lincoln: Of Thee I Sing shows the Illinoisan grown up. He stands orating, a crowd gathered round him including a few uniformed Union soldiers, the flag waving, and a text reporting that he “kept our nation one.” Always trying to reach his audience, Obama refers to our “enslaved sisters and brothers,” and he exhorts children to work together as part of a family. Gingrich, by contrast, informs her audience that Lincoln was called “Honest Abe,” became a hero for freeing slaves, and was admired for his leadership qualities. The tone is what tells: whereas Obama attempts to bring children in, Gingrich favors distance and an odd conceit of “objectivity.” Neither book places Lincoln in visual proximity to anyone of color, despite the fact that this is what young children need to perceive pictorially. Only Gingrich mentions war; and neither gives children any real idea of the reasons we revere this beleaguered president. Rather than superficial glosses, what children need are American histories that treat important matters importantly. As Jerome Bruner famously wrote, we can teach highly complex ideas even to the smallest children when we know our subject well and know the capacities of our audience. We could use books—preferably not written by celebrities—that teach twenty-first century American children to value our country’s past and present in wide contexts that explore aspects of other countries as well as the planet itself—books of substance, which connect children to greater horizons by challenging them with unresolved problems and stimulate the growth of their innate powers of empathy, imagination, and responsibility. Ellen Handler Spitz is Honors College Professor at the University of Maryland (UMBC). Her most recent book, Illuminating Childhood, was published in early 2011. She writes regularly about children’s literature for The Book.